One of the most important tasks for any ecommerce or retail business to complete in the lead up to the financial year-end is stocktake. It’s a hefty task to undertake especially at such a busy time of year, but an effective inventory management system can do a fair amount of the heavy lifting for you. Combine it with a year-round inventory strategy, and stocktake becomes a much less worrisome affair. Do You Need to Undertake an EOFY stocktake? First thing’s first, not every business is required to perform a stocktake. Yes, you read correctly – the ATO stipulates that only businesses that turn over $10 million or more are required to do a stocktake. However if the difference between your opening and closing stock level is more than $5,000, a stocktake is required and this threshold applies to both increases and decreases. Of course, the best way to know what the difference is, in your opening and closing stock… is to do a stocktake. But keep in mind that an inventory management system will give you a pretty accurate idea, without having to perform an actual count. A stocktake is a physical count of every item in each of your product lines. Many businesses manage their stock (and their stocktake) with a simple Microsoft Excel spreadsheet. And while this method is relatively cheap and may seem ‘simple’ if you’re already using the Microsoft Office suite, it can actually be more time-consuming than you think and prone to mistakes, especially when you consider the set up, the actual count, the manual entry of data and the fact that it’s not live. Excel can be a great tool for businesses just getting started, but as soon as you start to grow, particularly if you’re selling across multiple sales channels, a cloud-based inventory management software is the best way to go. Even better? One that is embedded into your retail or ecommerce platform. As we mentioned, a good cloud-based inventory management tool takes the stress out of stocktake season, giving you the ability to (excuse the pun) take stock of your stock at any time and stay on top of your inventory year round. Let's have a look at some of the main benefits and what to look out for. Our biggest tip with regards to stocktaking is to actually complete a number of stocktakes throughout the year – as frequently as possible actually – even if it’s just a partial stocktake by location, by brand or by product type. An accurate inventory count is vital for fulfilling orders and ultimately keeping customers happy. Stock variances can also assist in identifying issues and the more often you’re counting stock, the quicker you can find and rectify issues. Neto has in-built inventory that makes stocktaking quite a straightforward process. Once you identify the products you need to count, you can either print a countsheet for a manual stock count, or even complete the count via mobile or iPad. You can also continue trading while you stocktake (no more counting till midnight!). One of the biggest challenges for omni-channel retailers is managing the complexities of order management, inventory and fulfilment for multiple sales channels. Is your inventory for your ecommerce store synced with your eBay, Amazon and physical stores? What happens if a customer orders something online and returns it in store; how will your inventory system cope? 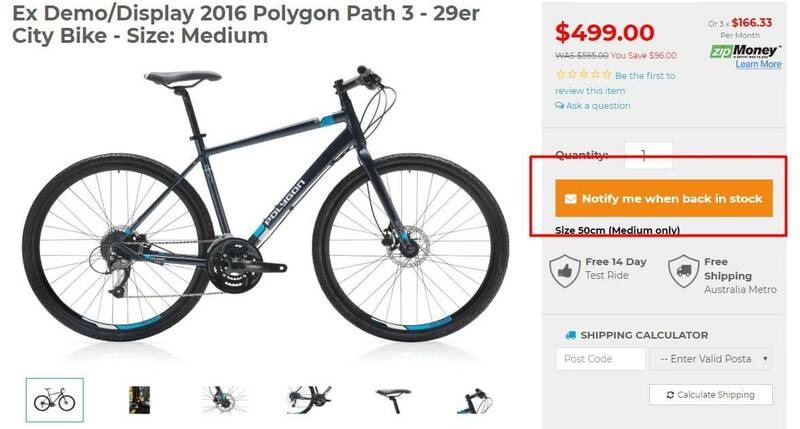 Neto Retailers Bicycles Online, stock updates as they sell and even gives customers the option to Notify me when back in stock, if they still want the product. With shoppers expectations of speedy delivery only increasing, it’s more important than ever to ensure you can meet their demand. Yet many retailers still operate single systems for each of their channels, and if you’re using a spreadsheet this can become quite messy—especially during a stocktake! One of the most helpful features of inventory management software like Neto’s, is the ability to easily count and keep track of your products across multiple sales channels, platforms or warehouse locations. You can set buffers for stock across each channel and transfer stock between between channels if you’ve run out on eBay for example. Stock buffers also help ensure you don’t sell an item that’s not in stock, leaving your customer in the lurch. The average accuracy of inventory for retailers sits at around 63% and if you’re using spreadsheets it’s likely to be much lower. Unlike an inventory management system that operates in real-time, spreadsheets are just a snapshot in time – they can’t give you insight into issues such as slow moving stock items or sales trends, or respond quickly to replenish popular products. The Inventory Management System has been a huge timesaver for us because there is no need to do manual updates. We receive minimum quantity alerts from Neto and from there sending a purchase order to our suppliers is as simple as ticking a box. Does it integrate with your ecommerce platform? 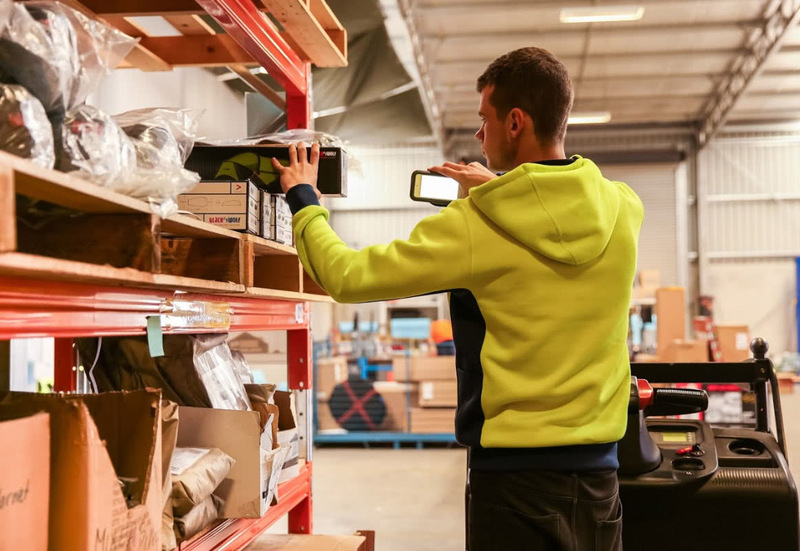 Many retail platforms allow you to plug in third party inventory management platforms which will sync with your sales orders, but sometimes this is more trouble than it’s worth if there are issues with real-time tracking or dramas handling stock between multiple locations. Here at Neto we built our own advanced inventory management tool to control your stock right from within the same place you manage your orders, fulfilment and shipping, no matter how many warehouses you have, locations or sales channels you sell in. Start a trial to try Neto Advanced Inventory for free. Summary of invoiced sales by SKU AND summary of payment receipts by payment method for a given date range. Results are based on data invoiced and date payment receipted. Ideal for recording sales and payments for bookkeeping purposes. Report of all stock and stock values currently in your locations. A stocktake essentially gives you confidence in the figures you’re working with and using an inventory management system to prepare and carry out a stocktake will have you leagues ahead of the rest. 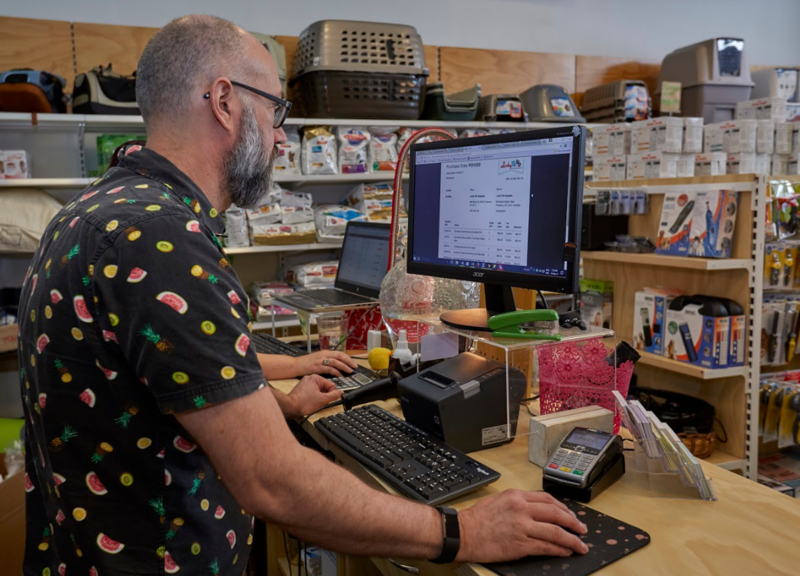 Understand the true value of your stock: manage your stock in the most cost effective way possible, ensuring you have the stock necessary to meet the demands of your customers and identify slow moving stock. Make adjustments to stock counts at any time, which is really handy for writing off expired or damaged stock (as well as updating figures to match your physical stocktake). 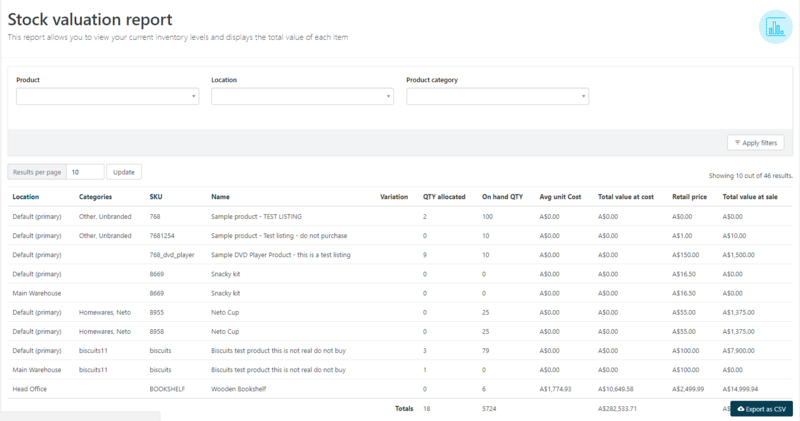 Stock control tools allow you to create purchase orders, receive goods into stock and calculate an accurate cost price which is then carried across to your accounting platform. Stock alert and forecast demand reports let you know when stock numbers have reached a minimum level and require ordering (even taking into account supply lead times and sales velocities). Did you know that by improving your inventory management by just 15%, you could add as much as 30% to your bottom line? Now that’s a great incentive to get stocktaking and get Neto Advanced Inventory up and running!